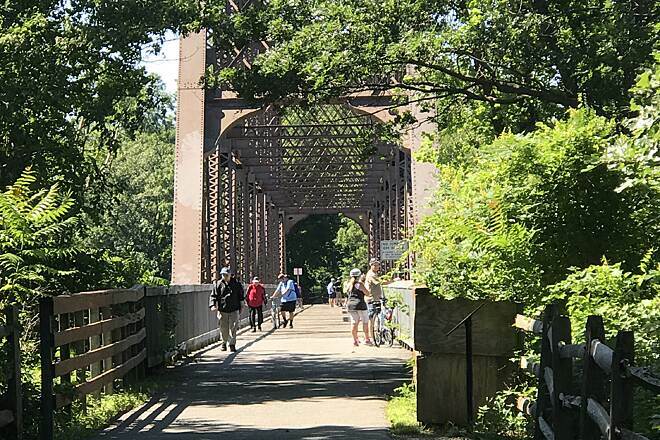 The North County Trailway is the longest of the four connected rail-trails breathing new life into the former New York Central Railroad's Putnam Division line. The "Old Put" provided passenger and freight service between New York City and Brewster, in Putnam County, from the 1880s. Passenger service ended in 1958 and freight services ended in 1980. 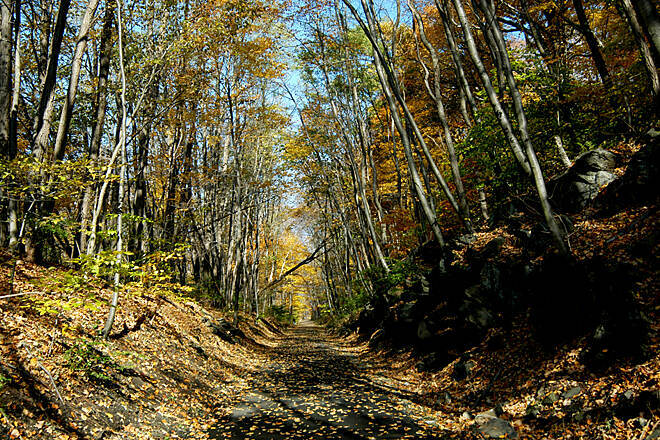 The trail spans more than 20 miles in Westchester County. 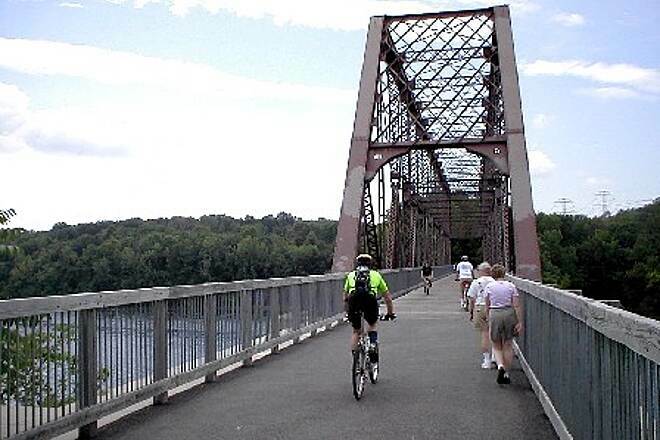 From Mount Pleasant (where it becomes the South County Trailway on its southward trek to the New York City line) the trailway extends north to the Putnam County border, where it seamlessly transitions into the Putnam Trailway, rolling 9.7 miles north. From Old Saw Mill River Road at the North County Trailway's southern end, the trail runs parallel to the busy Saw Mill River Parkway on the right and woodlands and a power transmission corridor on the left. After crossing over Old Saw Mill River Road, there is a side trail on the left that leads down to a parking lot along the road. 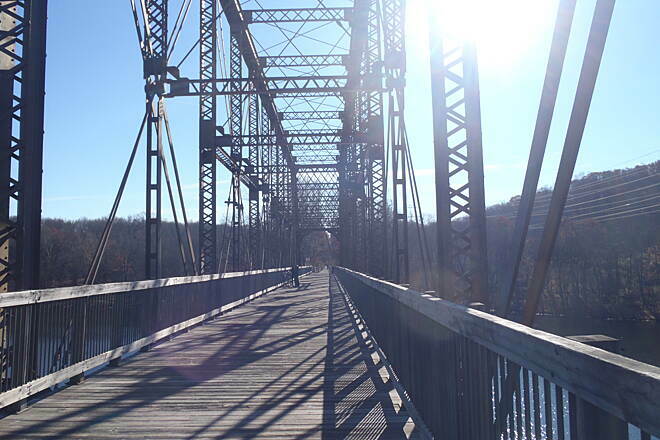 The trail then crosses State Route 117, Bedford Road, on a bridge. Highway traffic is never far away from this southern section of the trail, but a narrow strip of trees provides welcome shade and screening from the traffic. Just beyond Pleasantville Road is a side trail to the Tudor-style Briarcliff Library, formerly the Briarcliff Manor train station. 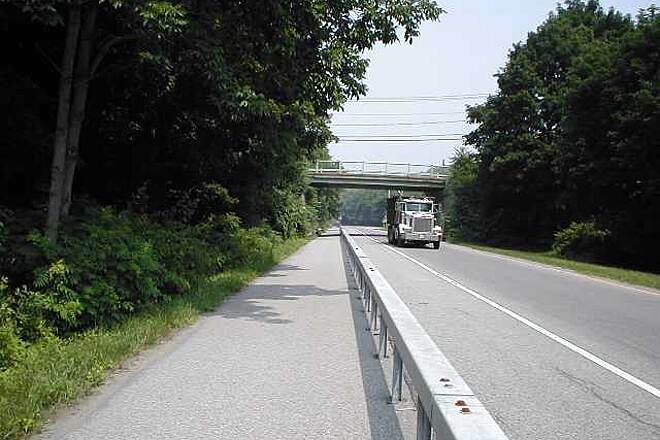 Then you hit the first of two on-road detours: Saw Mill River Road, which parallels the trail corridor here, provides a wide shoulder for the short distance to Chappaqua Road, when the rail-trail returns and runs you through the woods between Saw Mill River Road and the Taconic State Parkway. Your second journey on the shoulder of Saw Mill River Road begins at the intersection of North State Road. 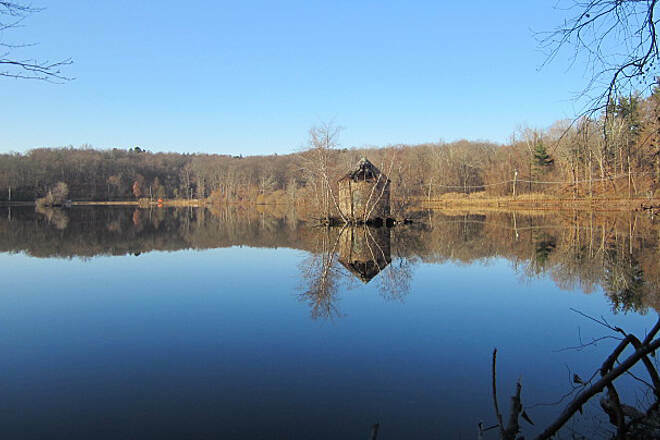 This 0.75-mile detour takes you past Echo Lake State Park and over the Taconic State Parkway before the North County Trailway resumes on rail corridor. The trail through Millwood looks out on commercial and industrial buildings before crossing Millwood Road and entering a wooded stretch. About 0.75 mile of this wooded area is the edge of Kitchawan Preserve. 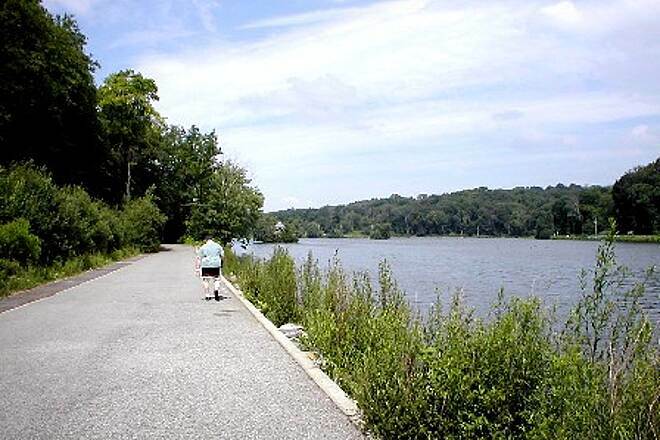 This sprawling property on New Croton Reservoir, once a research facility of the Brooklyn Botanic Garden, now has miles of hiking trails to explore. 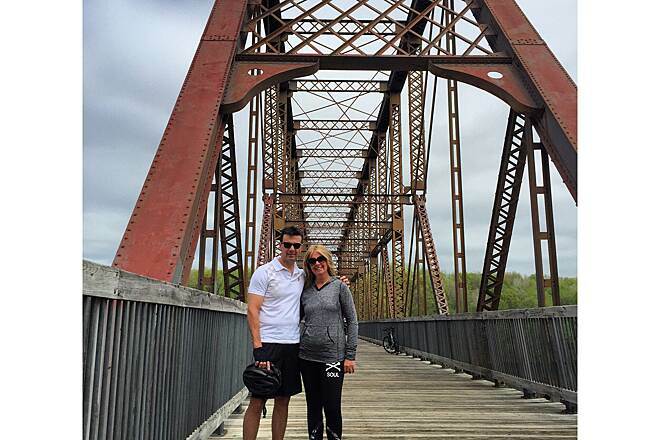 Staying straight on the rail-trail brings you to a bridge over an arm of the reservoir that supplies water to New York City. 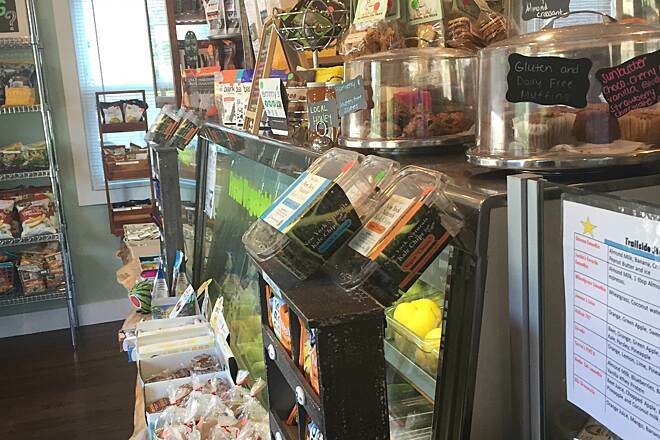 In the village of Yorktown Heights shops, including boutiques, galleries and jewelers, as well as restaurants, ranging from fast food to delis to cafes, are only a block off the trail. Shortly after leaving the village the trail crosses Saw Mill River Road -- this time at a steep grade, so be cautious. Beyond Granite Springs Road a large orchard signals the trail's transition to a more agricultural and forested setting for its final 6 miles. The trail ends in Somers at Baldwin Place when you emerge from the woods. 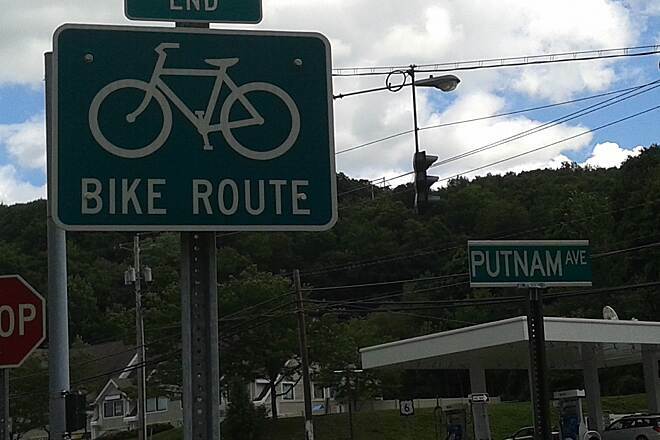 The Putman Trailway begins when you cross Route 118 (Tomahawk Street). Parking here is adjacent to a shopping center that contains a number of restaurants. Parking for the southern end of the trail in Mount Pleasant is in the Eastview Park and Ride Lot. Take Saw Mill River Parkway to Exit 23 for Eastview. 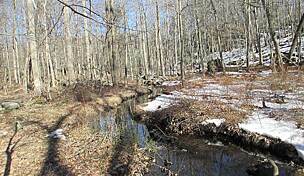 Follow Old Saw Mill River Road west until it becomes Neperan Road. The park-and-ride is on the right side of the road. 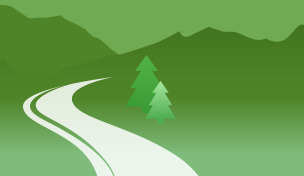 To reach the Somers trailhead from the Taconic State Parkway, take US 6 east. Bear right onto State Route 118. Turn right onto the Somers Commons Shopping Center access road. A dirt parking lot for the trail is on the left. A dirt path leads up to the trail. Dateline: Sunday, July 15, 2018. Weather: Upper 80's to 90F, very humid. Starting from north headed south it is a pretty good trail with some very nice scenery, until you reach Millwood. Then it goes from woodland trail to NOISY bike route next to highways. No rail trail surface is perfect and we are very lucky to have off-road paved trails, so I am not going to criticize a few sections of root bumps. It is a worthwhile trail to experience. I had already done the Putnam County rail trail 2 years ago, which leads right into this one seemlessly. So this time I parked at the northern end in Baldwin Place and went north a bit to find where I turned around last time. I did not intend to do the whole trail for a roundtrip of 44.2 miles, but since I had an energy drink just before starting I kept going. When I got the the SCRT sign, I stopped and looked at my Strava app, which stated I had already done 25+ miles, because I forgot I did about 3 miles on the PCRT before starting on the actual NCRT. So now I figure it will be my first 50-miler! When I got back to my parking area I was SO tired and ready to drop when I realized it would only be about 48+ miles and I needed to go at least another mile north to make 2 more miles for 50. I did it - slowly, but it was not wise to do on such a warm day. I should have waited until autumn and 20 degree cooler temperatures. This is a hybrid/mountain bike trail. Great riding experience. The North County Trail is suffering from serious neglect. It used to be a well maintained, smooth riding experience. It is now in danger of becoming a Civil War era corduroy road. There are many areas that are in desperate need of re-paving. There is also a section that was eroded during Super Storm Sandy and has not been repaired. It's a shame that what was once a terrific trail has been allowed to degrade so much. I enjoy a good ride, but also am looking for a good place to train. I rode from the RT 117 junction north for about 10 miles. The trail was much bumpier than I was used to. There is a clear knowledge of the state of the trail, the larger bumps and potholes are sprayed and there are signs warning of 'uneven pavement' but it was not super enjoyable to ride on at higher speeds. My biggest concern is the RT 100 section. There is about a 1 or 1.5 mile stretch where you are on the shoulder of RT 100. If you ride out and back you end up having to cross 4 times, once at an intersection, with all others being at crosswalks with no lights or markings. Although the shoulders are wide they are filled with gravel and pot-holes forcing you to ride closer to the shoulder line than preferable or risk a flat. Additionally, you have to cross an on-ramp/off-ramp to stay on the shoulder. All told its a bit to dangerous for my taste. The section starting at Millwood and going north seemed nicer. Ill probably try again parking up there and going all the way onto the Putnam Trail, but I don't know if its worth it to ride the RT 117 to Millwood section again. I rode (using my cyclocross bike) this trail today end-to-end in conjunction with the Putnam Trail to make a 62+ mile out and back ride. Overall the trail is in fairly good shape with somewhat tricky start/end points as noted in the previous review. As there is really no parking at the southern end I parked in a commuter lot just off the Saw Mill parkway about 2 miles from the south end and backtracked to complete the end-to-end. While a road bike could be used for this trail I suggest a hybrid or cyclocross bike due to some tough pavement in spots and pretty heavy debris on the two on-road sections. The Putnam Trail is fine for a road bike. Perhaps this information will not apply to most of you. 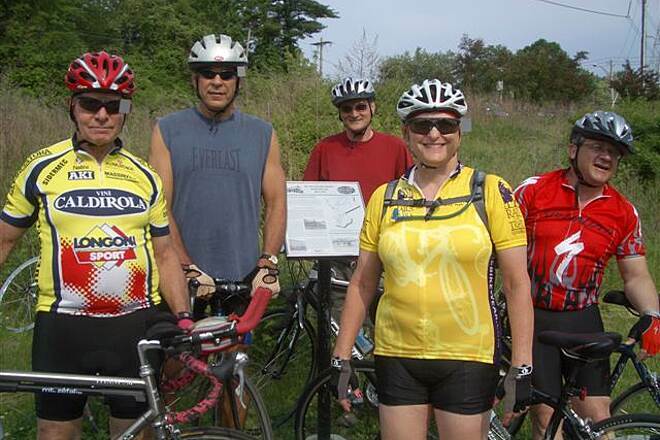 Many people just ride a segment of the North County Trailway or they ride it in segments. My goal was to ride the entire length of the North County Trailway and then turn around and ride back to my car. When you get to the northern 'end' of the North County Trailway, you might miss the little sign that says you are entering Putnam County. The trail looks the same, but if you were planning to turn around here, you might not notice that you are done going North and should now go South. On another day, I left my car in the same parking lot and got on my bike and started going South. I thought that on my first excursion I had done the entire North County Trailway up and back, but that was not correct. I went South for maybe a mile or two and came to a street crossing. This was apparently Warehouse Lane in Elmsford, NY. When you get to this point, you have finished the North County Trailway. I didn't see any sign to that effect, but I could have missed it. Not knowing what to do, and not particularly worried, since there were other places on the North County Trailway where the signage was inadequate or confusing, I continued ahead. I ended up in a parking lot. Couldn't find any trail leading out from the end of the parking lot, so I turned around and headed back to Warehouse Lane. 1) I had previously gotten to the end of the North County Trailway. 2) The North County Trailway does NOT run into the South County Trailway, as I had incorrectly assumed. 3) You have to go on city streets to get from the end of the North County Trailway to the beginning of the South County Trailway. If you start your ride at the Eastview Park and Ride, take a few minutes to cross the street and ride the short segment of the trail along the reservoir. If you go on a sunny day, the reflections on the water are pristine. I parked at the trail head on Old Saw mill river road, the south terminus of the North County Trail. I ride a road bike and thought this would be a nice change of pace. While I was not expecting freshly paved asphalt, I did think the trail would be in slightly better shape. Some sections were better than others, and it seemed to improve as I went north - although there was a lot of debris and you need to pay attention. I liked the elevation change - while gradual there were some good long uphill sections. The route is well marked but you have to pay attention crossing route 100 and there is a lengthy section along the (wide) shoulder. I rode up about 15 and then turned back. Next time, I'll start at the other end or farther north. I really enjoyed the ride, but I'm glad I've got gatorskins. I normally use the northern part of this trail, but explored yesterday by starting in Yorktown Heights and heading south. When heading South, the bike trail has you cross the road (Rt 100, at a traffic light) and then ride the southbound shoulder. It's a wide shoulder, so that's fine. What I didn't like is that it brings you back in below Echo Lake State Park, where you have 2 way bike traffic in what is essentially the shoulder of the road, but protected by a guard rail. At first, I thought this was good, but it is so full of gravel and other debris that I ended up getting a flat tire! I would recommend staying in the southbound shoulder for that stretch until the rail trail picks up again (at least that's what I will do if I end up in this stretch of the trail again). I STARTED OUT FROM THE PARKING LOT OFF OF ROUTE 117 AND RODE NORTH. 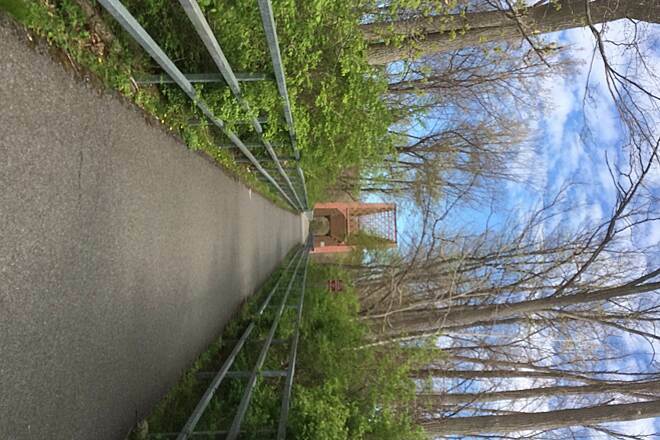 IT WAS A BRIGHT WARM SUNNY DAY IN EARLY MAY, I HAVE BEEN RIDING THIS TRAIL AT DIFFERENT TIMES FROM ITS INCEPTION AT VAN CORTLAND PARK. IN A 1/2 MILE YOU WILL COME TO BRIARCLIFF PARK WHICH HAS A PAVILLION WITH FOOD AND DRINK AVAIL.AND WHEN NOT OPEN A PORTA-SAN NEXT TO THE BUILDING ABUTTING THE TRAIL.CONTINUING NORTH IN ABOUT 2.5 MILESYOUN WILL LEAVVE THE TRAIL TO CROSS THE ROAD AND CONTINUE ON ABOUT 1 MILE OR SO TO THE INTERSECTION OF ROUTE 133.THE TRAIL PICKS UP OPPOSITE THE GAS STATION AND IF YOU CONTINUE STRAIGHT AHEAD ON THE ROAD INTO MILLWOOD WITH AMENITIES.CONTINUING ON THE TRAIL BY PASSES SOME OF THE TOWN,THERE IS PARKING @1/4 MILE BEFORE THE MILLWOOD NURSERY.WHEN YOU CROSS THE ROAD TO ACCESS THE TRAIL THERE IS A DELI ABOUT 100' UP THE HILL.AT ABOUT 10 MILES FROM ROUTE 117 LOT YOU WILL ENTER THE KITCHAWAN PRESERVE NICELY SHADED WITH STREAMS AND WETLANDS, THERE ARE NICE VIEWS ON THE BRIDGE THAT CROSSES THE RESERVOIR. THERE IS PARKING JUST AHEAD AFTER YOU CROSS THE ROAD. I CYCLED ABOUT 3 MILES AHEAD BEFORE RETRACING MY ROUTE SOUTH. ALL IN ALL NOT A BAD TRAIL THE PARTS ON THE ROADWAY WERE OK WITH THE TRAIL PROTECTED BY A ROADWAY BARRIER, BE CAREFUL THER ARE NUMEROUS ROADWAY CROSSINGS. THE PARTS THAT WERE OFF THE ROADWAY WERE FOR THE MOST PART SHADED AND SENIC,IF WITH CHILDREN BE CAREFUL ON THE ROADWAY CROSSINGS. 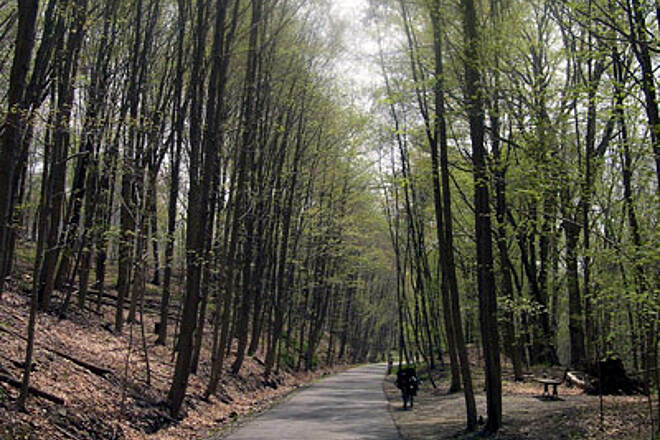 THE RIDE FROM VAN CORTLAND PARK TO THE ROCKERFELLER PRESERVE WERE MORE SENIC AND SECLUDED. NEXT TRIP I WILL START FROM THE KITCHAWAN PRESERVE AND CONTINUE NORTH UNTIL I COMPLETE THE TRAIL.THANKS TO ALL FOR THE INFO YOU HAVE POSTED ITS MAKES RIDING A TRAIL FOR THE FIRST TIME A LITTLE EASIER. In town on business and gave this trail a shot and what a treat. Parked in town and ran up to theorem bridge and back. Wide trail with beautiful views of the lake. Tree colors made it magical. Great for families and solo runners alike. 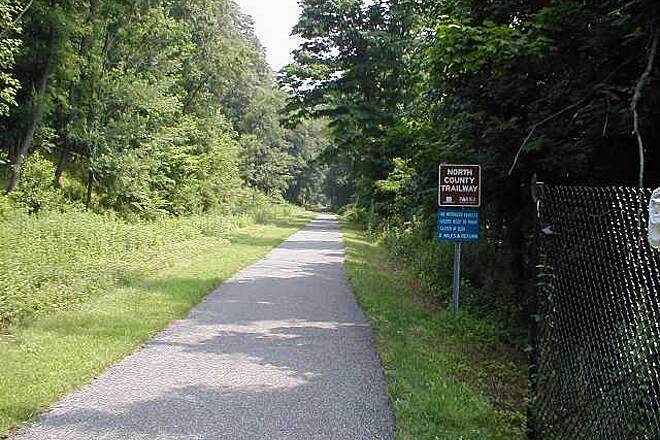 We rode this trail on 10/25 from the Eastview Park and Ride to just beyond Yorktown, which is almost 40 miles round-trip. The trail is easily accessed by taking a left out of the parking lot and following the bike route sign. The trail is a series of slight, gradual uphills and downhills. While not very challenging, you can get a decent workout. There are 2 areas where you have to ride on the road for short distances, which are clearly marked. The shoulders are wide so the road riding is very safe. 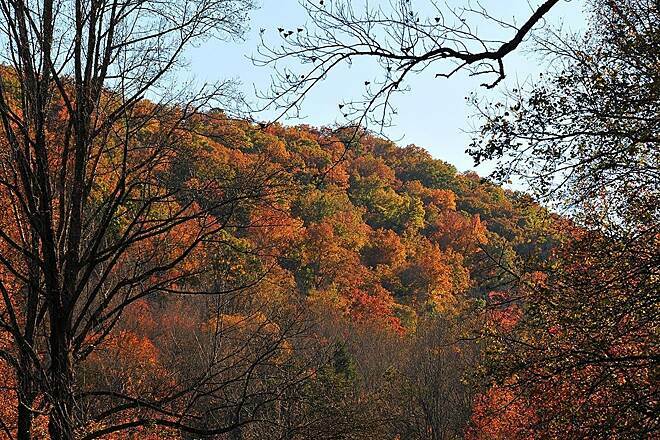 If you're going to look at foliage, most of the leaves have fallen already. I have cycled this entire trail from end to end a few times already this year and its almost 100 miles round trip if you combine all three sections. It starts off being called the "old Putnam trial" in the Bronx's Van Cortland Park then goes by the South County trail and of course leads into the North county trail to the end in Brewster NY. 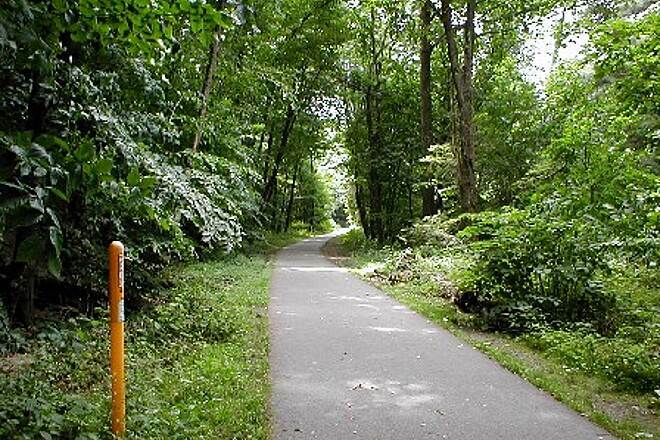 There are only a few completely "Paved" car free trails across the country that are 50 miles long. There may be prettier dirt and gravel covered trials in this country, but this is the best trail locally and has so many great qualities, like; long quite sections of forests and lakes, plenty of brooks, rivers, and waterfall features, towns, horse farms, apple orchards and nice peoples back yards to look at. The trail suffered some erosion by super storm sandy and a small section was closed immediately north of the reservoir bridge but was just opened recently with limited passage at this point. Thank god because the detour has put you on a narrow dangerous road and up a steep hill. There is another spot where you are actually on the highway shoulder, but all of this is fine considering the real crime of the trails very beginning in Van Cortland park and the lack of trail in Elmsford. The entire trails beginning in Van Cortland park and has no legitimate paved trail. Its a nasty muddy wood chip pit that's dangerous to bike on and still has the wood in the ground used for the rail road track which makes it impossible to bike over. You have to walk your bike thru ankle deep mud the first mile of trail after any rain because its lower and all water drains there. The parks dept. has refused to pave this one single mile to connect this entire trial to the park but has instead built a new club house for the golf course. This trail has been ignored. The other even more dangerous work around is in Elmsford. Travelers are forced on to a main and very busy road with virtually no sidewalk. Google this section on route 9A in Elmsford and see what I am talking about. This and all trails should be celebrated. I rode this trail in May 2014. Took Metro North from Grand Central Station, the 9:22am train, fare $13.50. Got to Brewster at 11:00am, found trail easily. Trail is well maintained and very shady. Slightly hilly at the start but sort of level after. Beware of the lack of signs or facilities, bring your own of everything. Trail has a few detours that will catch you off guard. If not sure ask for directions. Stopped at Yorktown Heights old rail station for lunch, again there are no bathrooms or water to be found. Made my way from North to South county. Stopped at Tibbets Brook park in Yonkers, rest room and water,etc found here. Continued south to NYC border. Trail at this point is dirt with some mud. Depending on previous rain fall, this path could be dry or a muddy disaster. Made it to the #1 train station at Van Cortland park. Total travel time was 6.5 hours with lunch stop and total miles was 52. I can't wait to do it again. 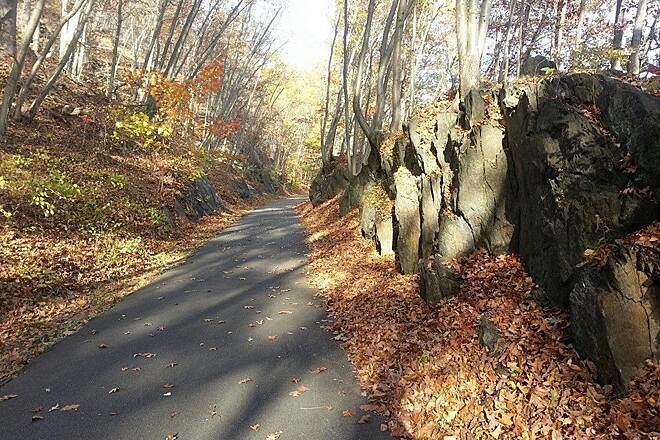 I ride this trail from Tibbets Brook Park in Yonkers up to Brewster and back in the late summer early fall months. 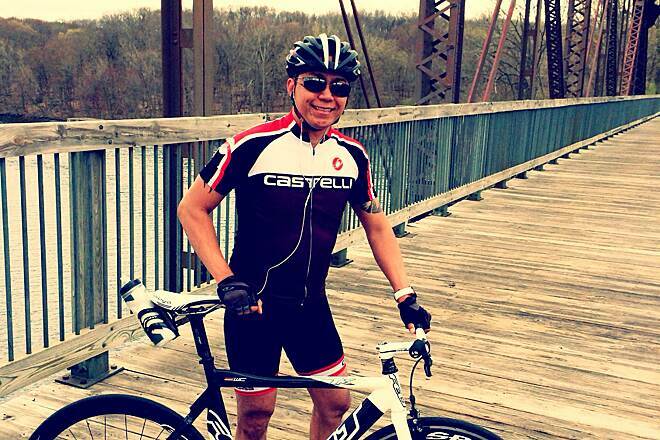 Safest in New York State if you're looking to do a 90+ mile ride with minimal road traffic. When you get to Brewster at the end of the trail there's a Subway, a pizza parlor and a Mobil Gas Station to re-fuel up for the trek back. Sporadic spots along the trail to stop for food/water as well. There's one or two bike shops along the trail too. 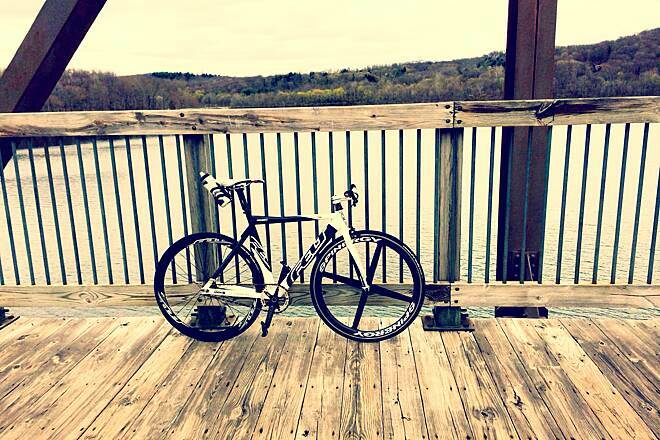 The bridge spanning over the Croton Reservoir is worth the ride alone. Recommended. But be aware that a short section of trail is closed just north of the reservoir crossing. Heading north, after you cross 118, there's a parking area; if you jog back to 118 there, you go about 1/4 mile north until you can jog back to the trail. I forget the name of the street you turn right on, but it's a steep incline about 50 yards back to the trail. If you're coming south to this point, be careful coming down that hill to 118. Starting in Yorktown Heights (about 5 miles from the northern end of the trail) over a two day period while visiting my wife's Dad, I rode on 17 of the 22 miles of this largely wooded trail. The first day I rode south about 5 miles from the parking area at Saw Mill River Road (Rt 35-202-118) and Quaker Church Road across the Croton Reservoir Bridge to Rt 134 at Kitchawan Farm. Then I turned around and rode to northern end of the trail in Somers. 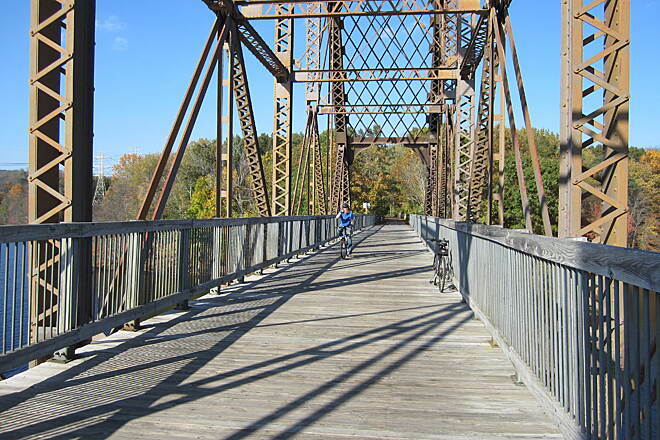 From Somers I continued on the Putnam County Trailway to Brewster and returned. From the same starting point, on the second day I rode south about 12 miles through Millwood en route to my turnaround point at the parking area at Bedford Road (Rt 117) about 5 miles from where the North County Trailway joins the South County Trailway. This is a great trail and I truly enjoyed my two rides on hot July mornings. For someone looking for a long bike ride or run, I can highly recommend all 17 miles (Bedford Road to Rt 118 in Somers) that I covered. And as I understand it, the southernmost five miles I did not ride are similar to the trail south of Millwood -- so for a long bike ride the entire trail is highly recommended. And most of the trail was shaded - a big plus in the summer heat. If you are planning a family outing, I would strongly recommend driving to one of the parking areas between Millwood and the northern trailhead at Somers and riding on some or all of the 12 miles of trail between those towns. The trail is further from the road in this section making the ride much more pleasant than it is further south. With the woods in full foliage for the summer I found it easy to image that I was riding on the Great Allegheny Passage in rural Pennsylvania rather than in the NYC metropolitan area. 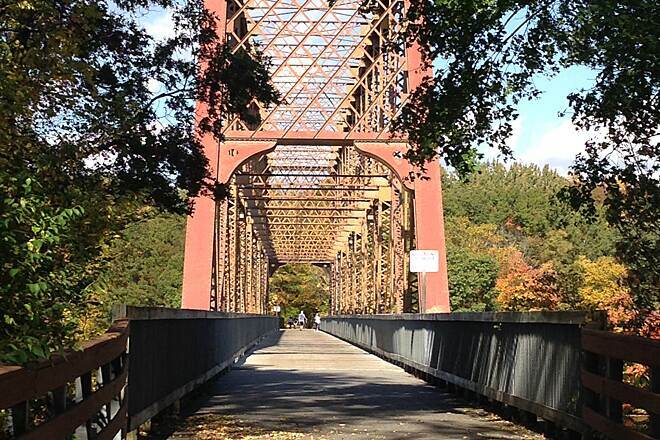 And don't miss the bridge across Croton Reservoir. It is the scenic highlight of the trail. 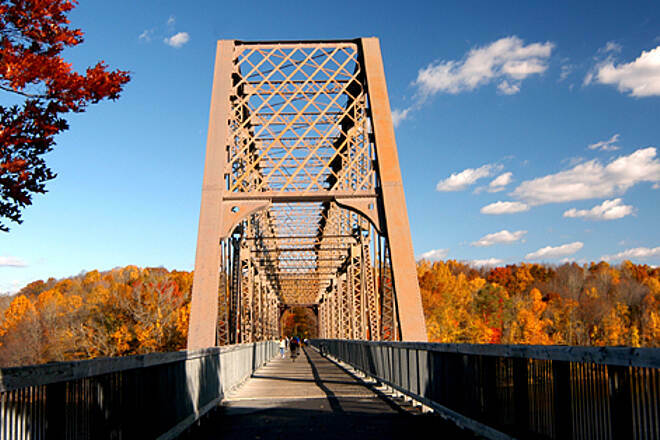 Located less than four miles north of the Croton Reservoir bridge, Yorktown Heights is a central location and provides an excellent base for a family biking or hiking outing on the North County Trailway. Railroad Park is located along the trail at the southern end of town on the grounds of the old train station. 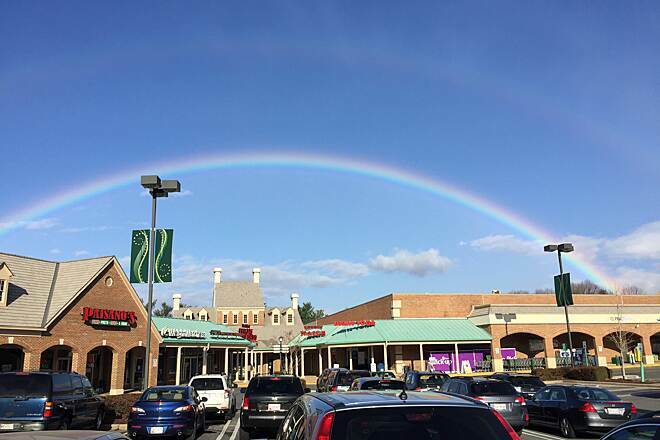 You can also find parking, shops, and restaurants nearby. Millwood (south) and Somers (north) can also serve as the base for an family outing. My husband and I parked in Amenia at the Rail Trail lot and biked 10 miles up to Millerton. With foliage full, only occasional views of countryside showed. 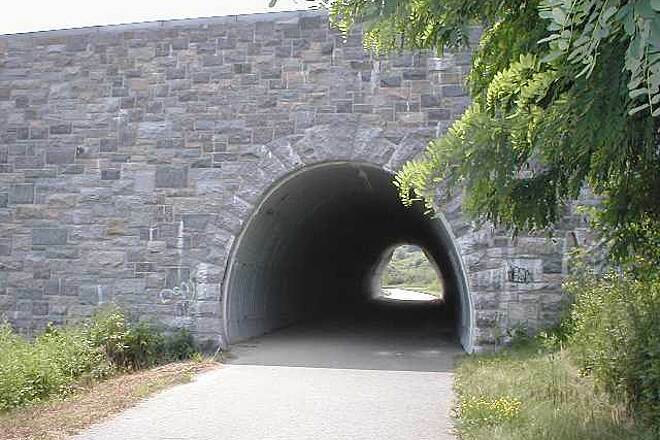 But the trail was also a cool tunnel on a 90-degree day. Bugs are plentiful, so use repellent. Three flew in my eye. Near Millerton in the middle of the woods is a series of three small houses, rustic, gate-size, and elegant facaded, which surround a small pen with long-horn bulls and a llama. A river rushes past on the far side. Charming and unexpected. Millerton is a very appealing town, with the original Saperstein's clothing store carrying styles from the '50s, it seems, as well as New Age eateries and artsy shops. We dallied about 15 minutes, then rode back to our car in Amenia. Whole trip took 1:40. Then we drove up to Bash Bish Falls in Copake, took a dip along the trail to cool off, and headed home to CT, stopping at McEnroe's organic farm (on a hill on the right, between Millerton and Amenia) for egg salad, strawberries and Harney's apple juice. Yum. 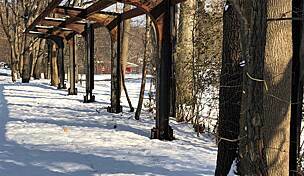 This is a great trail but the Putnam County portion is going to ruined see the following story. Discovered this trail just a week ago...left from Tibbetts Park in Yonkers at 6am Sunday morning and rode the 11 miles to the end in Elmsford. Most of the way the surface is very good though there are 2 rough areas in the northern end. But with few road crossings you can ride well through woods and some very nice scenery including plenty of the Saw Mill River. I did not do the 3 miles south of Yonkers yet (to Van Cortlandt Park in Bronx) though it looks promising. I joined R2T after it helped me find this trail - just 10 mins from a relative I was visiting in Westchester, NY. And what a trail?!! The asphalt surface is in excellent condition. The superb maintenance showed when, only 2 weeks after Hurricane Sandy, the felled trees were already cleared from the path. 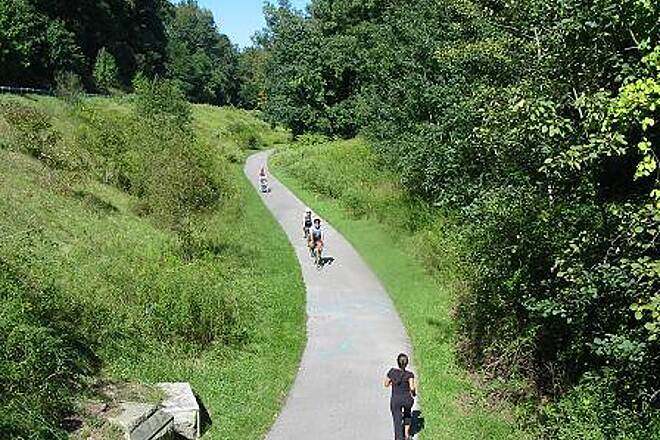 The trail has the gentle slope and moderate curves of the old railway line. Some of the southern miles run along a local highway, but the next 8 southern miles (that I ran) range from secluded suburban to forest. The bridges over local reservoirs were especially spectacular. Best of all, I ran on a perfect day in early/mid Nov when the weather was crisp, the air pristine and many trees still held their autumn vibrance. It was, for me, a day and trail to savor and remember. Road this last Friday. It was amazing. Started from Brewster station and rode back to the city with a few friends. 73 miles! The road was perfect no pot holes, just a few uneven roads. Best park its private! no traffic. Amazing. Alas, I guess the Powers That Be decided that enough was enough, and removed the beautiful Beaver Dam from the stream about a half mile north of Rte 35. They had been there all through the winter, and while it caused a bit of an overflow onto the Trail, it was well worth it to see them create & enjoy a whole new aquatic habitat -- the Frog Symphony alone was worth the trip! It's now back to a small stream, with only the muddy, skeleton remains of the beautiful Pond the Beavers had created. 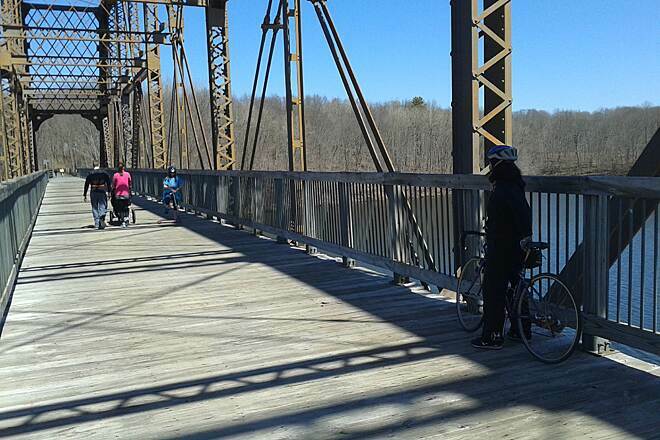 Thanks to the relatively mild Winter so far, as of late January the North County Trailway remains in great shape for cycling. The rail trail between Millwood, NY and the Putnam County border has been remarkably clear of fallen branches and debris all Winter. Yesterday (Jan. 24) I discovered why. Westchester County has a two-man tree crew with a leased cherry picker working along the trail to clear overhanging deadwood. From a brief conversation, I got the impression this was mainly a safety/liability issue -- the County is (rightfully) concerned someone could be clocked by a potentially deadly falling tree limb. But it's also a boon to cyclists! The chronic flooding north of Route 35 seems to have been solved by placing a drain pipe about 18"-inches below the top of the beaver dam. The water level remains high alongside the trail, but even after 6" inches of snow on Sunday and a heavy rain on Monday, there was no flooding on Tuesday. In fact, there was only one significant icy patch to be found on the entire 12 mile ride between Millwood and the Putnam County border. Ride on! 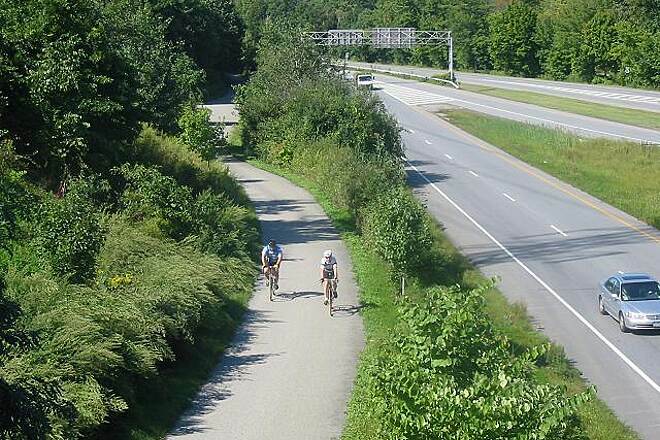 The complete off-road section of the North County Trailway from Milwood, NY to the Puntam County Border (at the Route 118 Trailhead and Mirabella's Cafe) is now completely open--as well as the Putnam County Trailway from the Route 118 Trailhead to the Brewster Trailhead. HOWEVER, following a heavy rain there is a short section -- about 200 feet -- of the North Country Trailway which floods thanks to the work of eager beavers (literally!!!!) that have built a dam at a low spot along side the trail. The flooded area is about a mile north of Route 35 (between Yorktown Heights and the Putnam County Border). 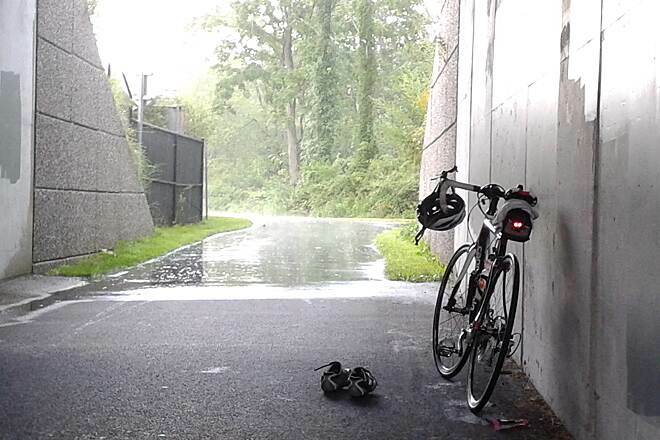 When flooding happens, the Westchester authorities post a "Trail Closed" sign on the north side of the Route 35 crossing -- as was the case several weeks ago when we cycled the trail after a heavy rainfall the previous night. We ignored the signs -- along with most other cyclists -- and found the flooded stretch to be passable at slow speed with only about 4 to 5 inches of water over the asphalt in the deepest area. Not even a problem for our Terra Trikes with 20" wheels. 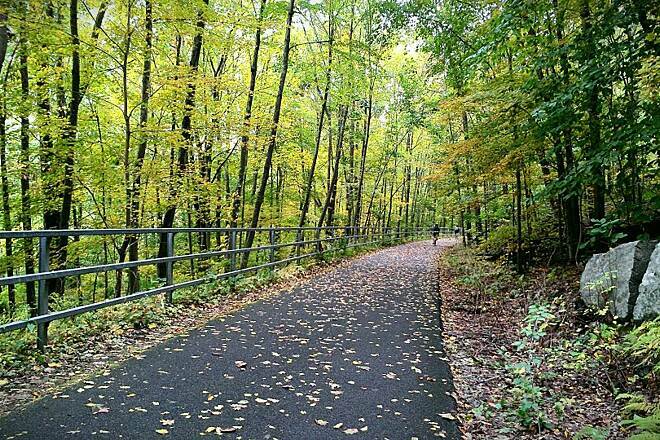 The trail is especially beautiful right now as the Fall foliage is nearing its peak--although the presence of wet leaves and fallen branches may pose problems for road bikes. 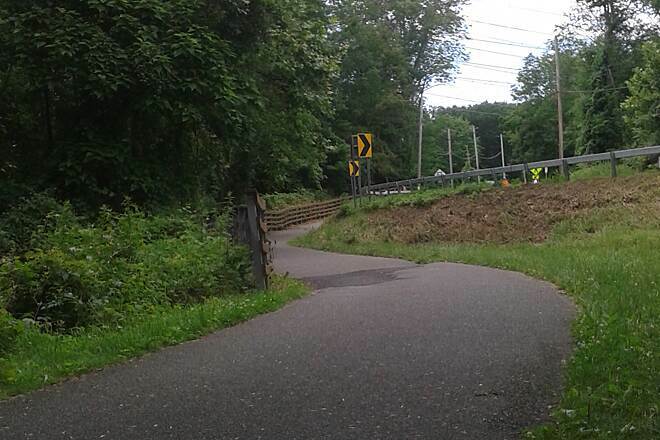 As of my ride on Sept. 8, there were still barricades with "Path Closed" signs on a portion of the trail between Millwood and Yorktown Heights. The barricades were being universally ignored -- and even on the officially "closed" section, all fallen trees had been cut and cleared at least enough to open the full width of the trail. There were, however, many dead branches, and even several trees, still hanging precariously overhead. 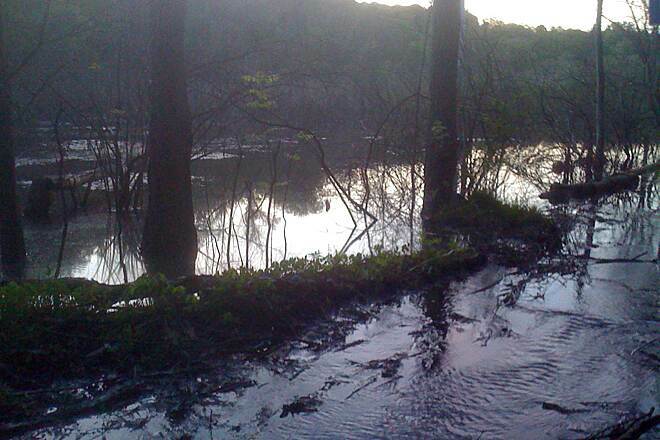 There was also some flooding and lots of debris--mud, gravel and branches--on the trail. In a few spots, the trail shoulders were eroded. And in several places the asphalt had partially collapsed, effectively narrowing the trail to one lane. However, these were all well marked with orange cones and the trail was passable -- even for my recumbent trike. I didn't travel north of Yorktown Heights -- although while driving home, I could see yet another "Path Closed" barricade on the north side of Route 35. 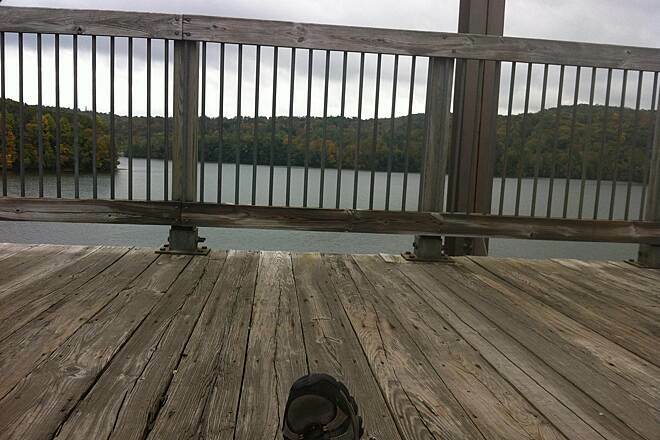 On Sept 9, I triked the Putnam County Trailway between downtown Mahopac and the trailhead at Putnam Ave. in Brewster. 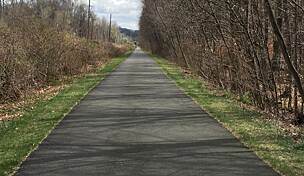 The trail was open with minor debris and flooding along with a few fallen, but cleared, trees in the heavily wooded section of rail trail between Mahopac and Willow Road. The new bike path extension between Willow Road and Putnam Ave. in Brewster showed very few signs of storm damage. On Friday July 5th I rode 18 and a half miles up form the park and ride at Saw Mill Parkway at exit 23 37 miles round trip. The first eight miles where great and then there is a very bad spot at rt 9a where you have to cross the road and then ride next to cars where the speed limit is 55 mph. The second spot is on rt 100 where you are also next to cars going over 55 mph, not a family friendly ride. If I was going to do this trail again i would start at echo lake and go north. From that point on this is a very good trail. I was on my road bike and the pavement is not always the best but it is a great ride. 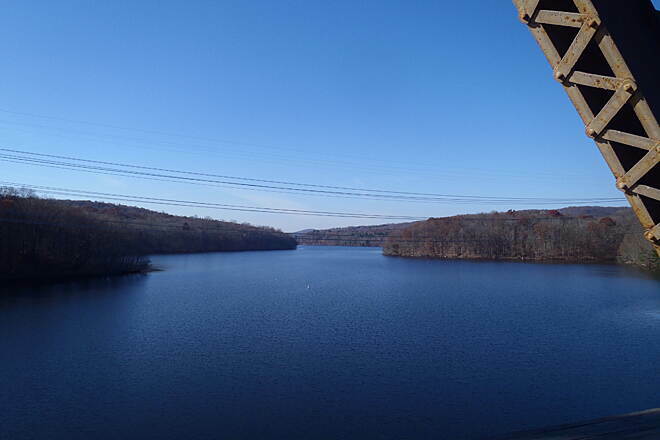 The bridge over New Croton Reservoir was the high light of the trip. There are a number of old train stations on this ride and lots of historical markers along the trip, I could picture the trains running though this valley. Mile markers are hit and miss but over all it is well marked. Again north of Echo Lake it is family friendly. Lot of shade most of the way. 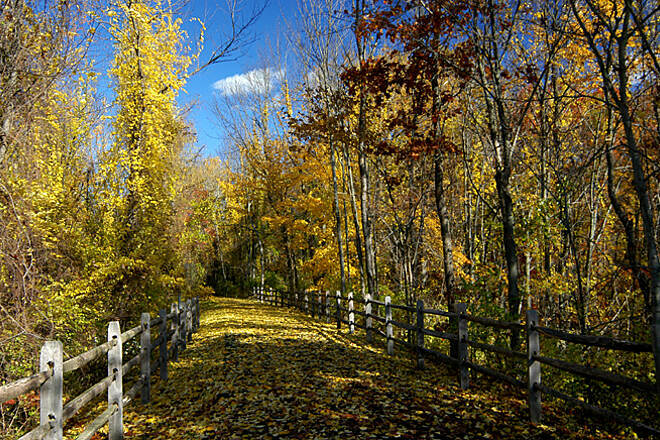 I am looking forward to doing the Putnam trail on my next trip up to New England. Now that the trail has been extended 2.5 miles, we figured out how to start from the new part of the trail. 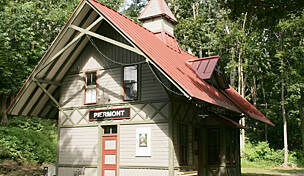 Take the Metro North to Brewster, NY, make a left out of the train station onto N. Main St and then bear left onto Rt. 6. After a couple of miles go under a tressle; make a left onto Tilly Foster Rd, a left onto Old Mine Rd. and a right onto the trail. The new section is beautiful - scenic & much more hilly than the rest. There are hiking trails to the right after the lake too. From Brewster to Brooklyn is about 80 miles so we stay at either the Budget Motor Inn on Rt. 6 in Mahopac (1 block from the trail) or the Ardsley Acres Hotel Court - just open the door in the fence to get there!. 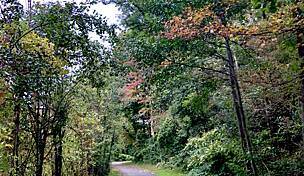 This way we can enjoy the trail for a couple of days, including the wood bridge over Croton Reservoir, the towns of Brewster, Carmel, Mahopac, Yorktown Heights, Millwood, Pleasantville, Tarrytown, Ardsley, and of course the peace & quiet of the woods, bunnies, ponds & deer. This trail keeps getting better! This trail has been extended! It now starts in carmel and runs 3+ miles into Maophac. Great job on the trail construction and lets hope more trails get funding for more miles. This whole trail is beautiful and goes through some nice towns. The weekend of May 22 there were Boy Souts volentering their time to construct bike racks on the trail parking lots. Great community job boys!!! The lemonade was good and i hope you raised alot of money. Geoff Miller, ride a trail, write a review!! The trail bits are very beautiful. The trail is pretty well shelterd from the wind. The bit where the trail is shared with NY 100, from Briarcliff towards Millwood, is a bit challenging. Traffic moves at 55+ along this bit and there are two crossings of this road required. 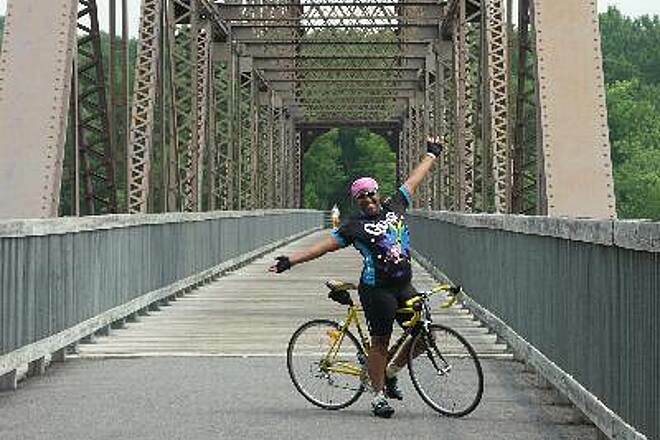 If I were to do it again I would start in Millwood and ride north to miss the bit shared with NY 100. YMMV. 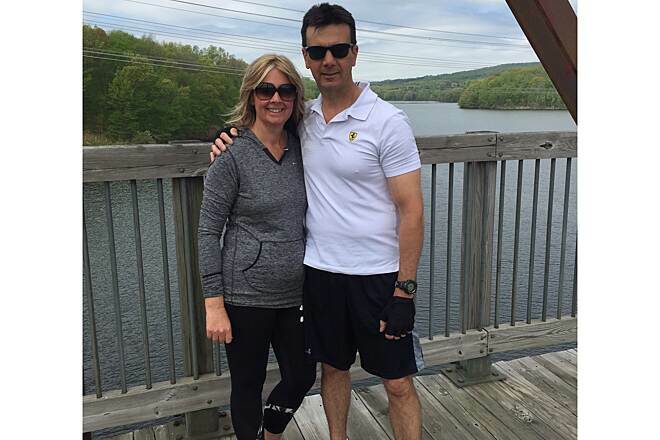 "We drove up from Brooklyn on a beautiful day to ride the trail for the first time. We parked at Eastview and headed north. We had a great lunch at the Moonbean Cafe on Pleasantville Road in Briarcliff Manor. You exit the trail at the old Briarcliff Manor Station (now a library), go right out of the parking lot, right again at the T-intersection, and it's a short bike to town. 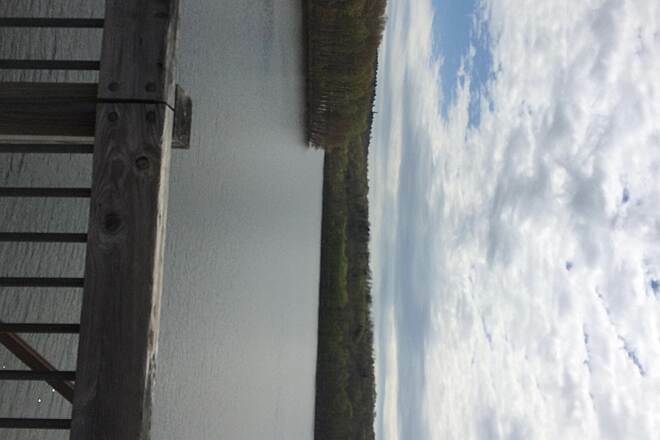 North of the New Croton Reservoir Bridge, in a marshy area, we saw frogs, a turtle, and a beaver. 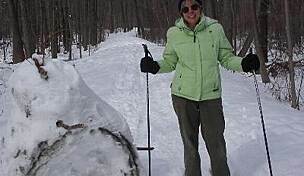 At the end of the trail, in Mahopac in Putnam County, the OTB located on the main drag near the trail has restrooms." "Except for a sign reading ""EAST/WEST"" with no other explanation the trail from the 118 trailhead was great. A sign with directions at Warehouse Lane would have been nice." "I road the trail today with my wife and 2 kids (12 and 9). What an awesome trail - a great way to spend a spring day. It's a ""10""." "My friend and I first rode this on 6/18/2003. We rode it again on 7/18/2003 and made really good time (since we saved over 45 minutes reading the historical markers). We did the north and south trailway of 36.2 miles in 3 hours. As you can tell by the posted pictures on here, the scenery is plentiful and full of history. You enter off Route 6 in Mahopac next to Wallouer's Paint (on the left) and the parking lot is just behind it to the right. The trailhead is right there and the first 1.5 miles is downhill, so just coast. 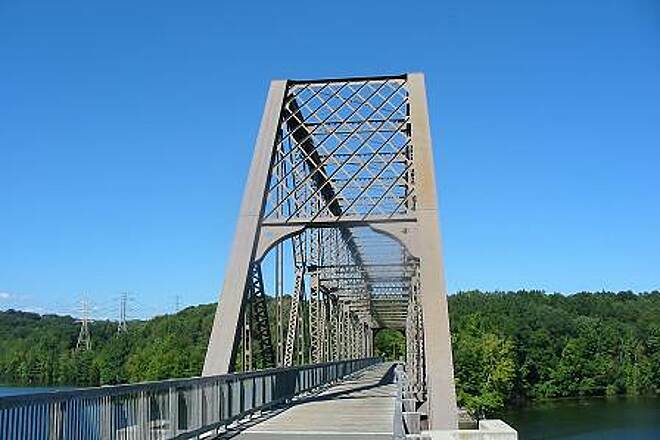 You will go over the Putnam Division Bridge over the Croton Reservoir. 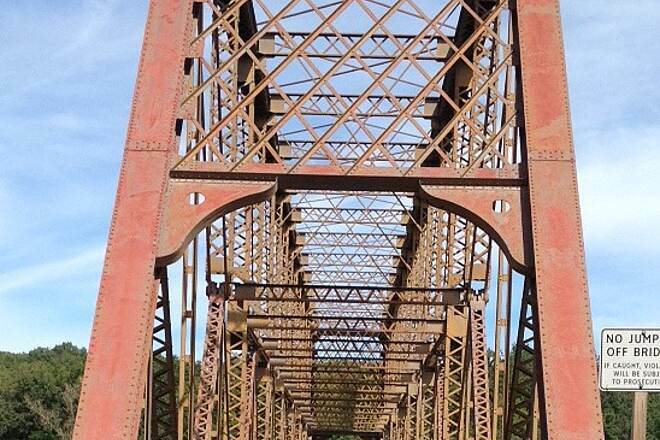 The bridge was built in 1905. A good rest stop to take is in New Castle around mile 11.5 or so just before you hit the old Millwood Station (which looks like an old Foto-Mat). It's a small suburb of Millwood and has a small deli on the right. 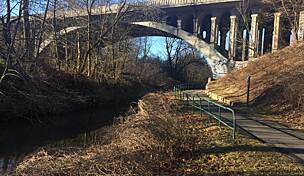 Then it's back on the trail and from mile 12-18 it basically hugs and follows Saw Mill River Road. The trail will first share the road with Saw Mill River Road for .5 to .75 miles on the right shoulder and it's a wide shoulder so you're safe and there are plenty of ""Bike Route"" signs. The only DANGER is you do ride through an exit lane and there's no marking for cars to watch out or for bikes. That was a little scary as the speed limit does exceed 55mph. Then the trail crosses over for 2 or so miles on the left shoulder behind the guardrail. Then it crosses over to the right again around mile 18. You will then come to the old Briarcliff Manor Depot which is very beautiful and has been converted to the Briarcliff Manor Public Library. Behind it is a picnic pavilion, parking and recreation fields. The next 4 or so miles is all woods with some benches and it's real quiet. The trail ends at with 2 bike signs reading east and west. Straight ahead is a bridge with stone sides and it's scenic. It should be noted that straight is obviously south. To the left it goes down to street level and ends at a Con Edison plant. (If you happen to cross the road, it's their parking lot.) If you cross and go under the overpass, you can ride up the on ramp to the Taconic and stay on the grass and there will be an exit/service road that enters a small lot and you can get back on the bridge). If you continue south past the bridge there is an orange fence blocking you but to the right is a small opening, so get off your bike. It does not make sense for it to be there as it is paved for a bit before switching to gravel and dirt. Maybe a sign saying, ""Unpaved, ride at own risk"" would be better. If you go to the right, it will take you further to Tarrytown on a feeder trail near Sunnyside Road near a reservoir. This feeder trail will connect you on the trail a few miles south. 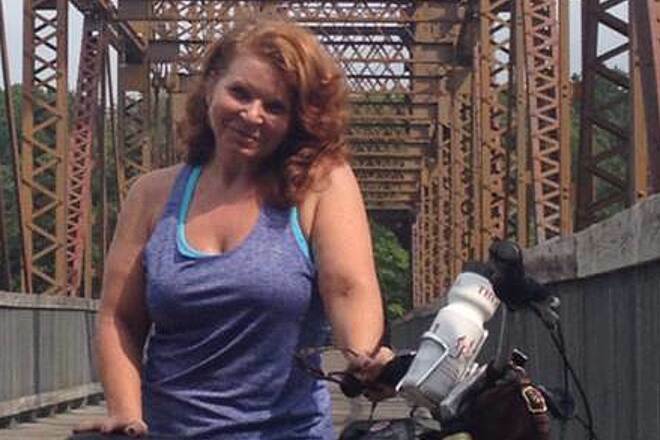 Read my review on the South County Trailway to get exact details after the orange fence. 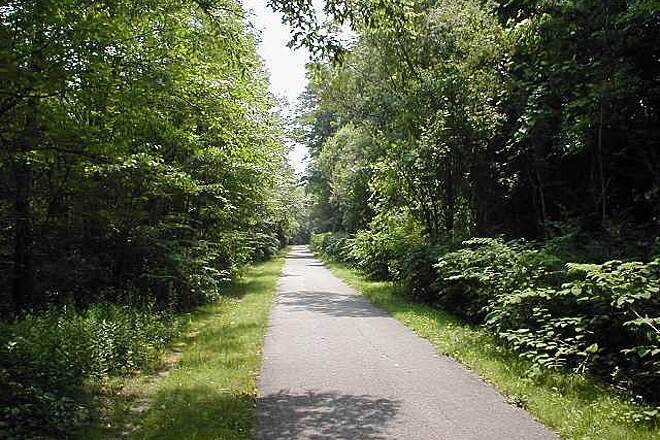 It's titled South County Trailway from 6/18 and the the path continuation starts at paragraph 9. Happy riding and remember, after the South County Trailway ends in Yonkers, it does connect to the John Kieran Nature Trail in Van Cortlandt Park in the Bronx around 234th street, about 7 miles further. 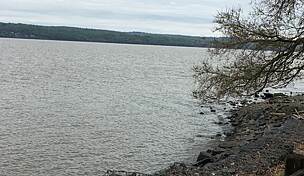 Read my review about that excursion under the New York City section for John Kieran Nature Trail." 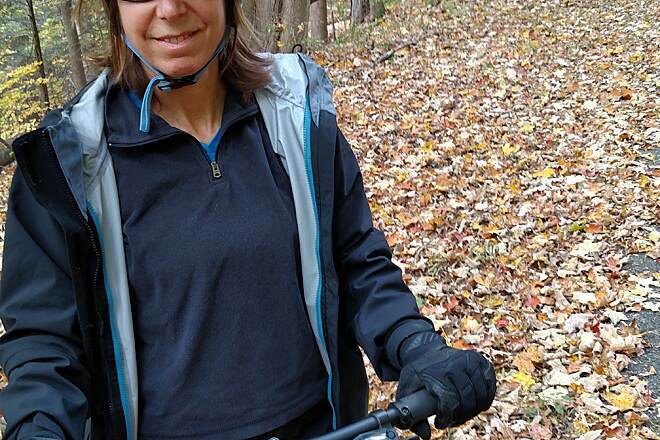 "I rode the south county and the north county trails from beginning to end during the fall on my way up to Brewster. I wait with anticipation for the completion of the additional leg through Mahopac and into Brewster. I tried it again this past weekend only to find -- to my disappointment -- that the trail is not cleared of snow in the winter. After four miles through snow, I quit. Oh well, I will wait until spring." There are lots of deer around this trail. Over a one week period I saw three bucks and a few blue herons. The northern section is quieter then the southern section. 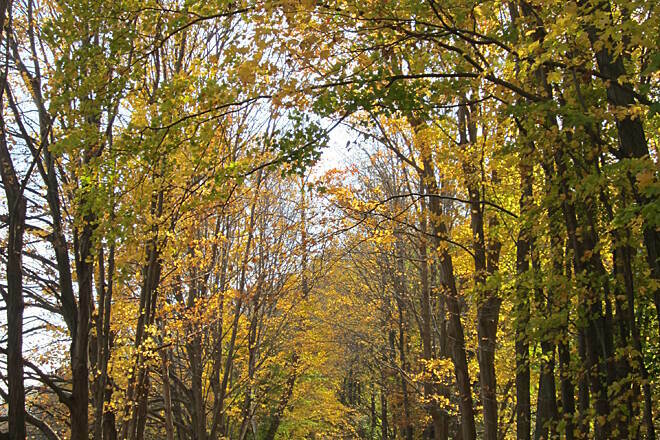 The trail is stunning in the fall when the canopy turns golden yellow. It's very well maitained I saw them blowing leaves off the trail twice this fall. 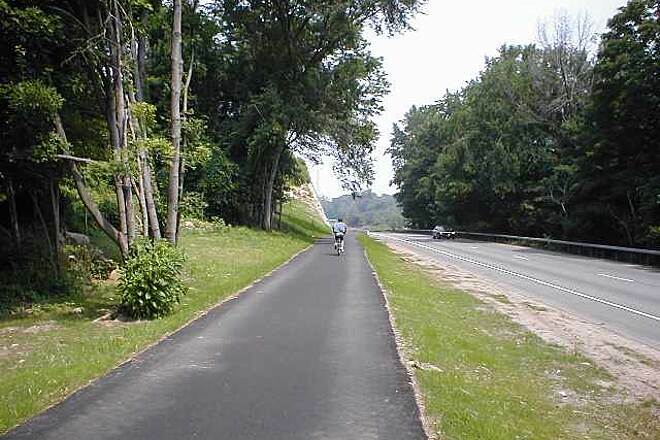 "As well as the Eastview/Rt 100C to Rt 117 section of the NCTW now being opened, you can go even further. Putnam County is finishing the remainder. 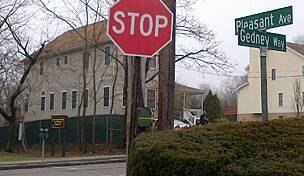 Currently the Baldwin Place/Rt 6 terminus ends the Westchester County segment. 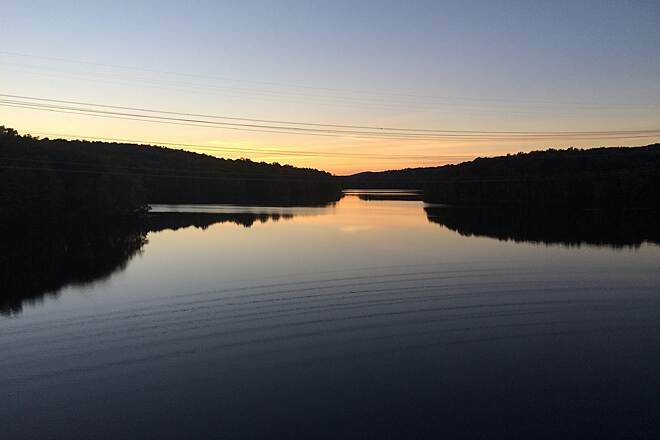 You can continue 1.8 miles to Mahopac on a newly complete section. So says the Putnam County Planning Office." This trail is the best for non-experienced riders and families looking for a great day of biking. The best starting point is at Millwood due to lots of parking and an easy town to find and get to. Heading north is your best bet. Make sure you stop at Yorktown for some lunch; this little town is great place to hang out for a few hours. I highly recommend this trail for a nice day w/your wife and kids or girlfriend. "The long awaited ""missing link"" between Hawthorne and Pleasantville is now open. As of this date, the surface is unpaved but is suited for walkers and mountain bikers. Westchester County Parks and Recreation advises that the surface should be paved by the end of April. 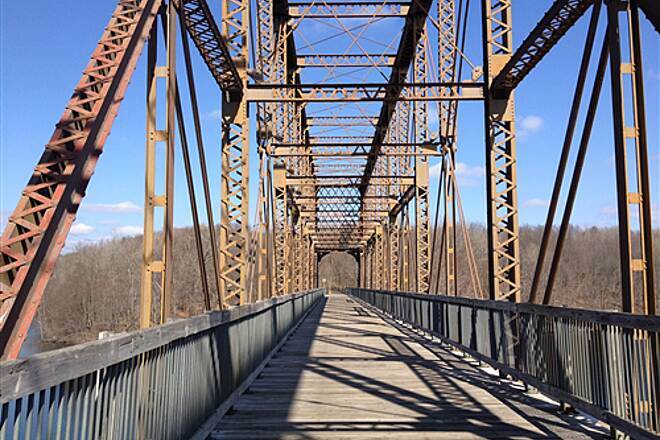 The remaining missing link, a connection to the South County Trailway, will soon be going out for bid. Expectations are that this project will take at least 2-3 years to design and build. 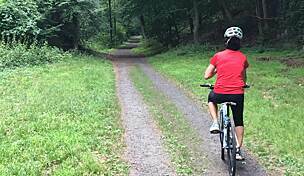 For now, you're able to travel through to Warehouse Lane in Elmsford on an unpaved surface." "I biked the round-trip route northbound from Millwood to Baldwin Place for the first time today. Total round trip distance was 25.8 miles. The northbound ride was somewhat strenuous, as there is a significant difference in ground elevation (height about sea level) between the start and end points. The return trip ride was a breeze. Keep this in mind when planning your expedition; better to go from south to north and have the easy leg on the way back to your car when you might be tired. Pavement surfaces were all in excellent condition. All damage caused by this past winter’s numerous snowstorms has been repaired. 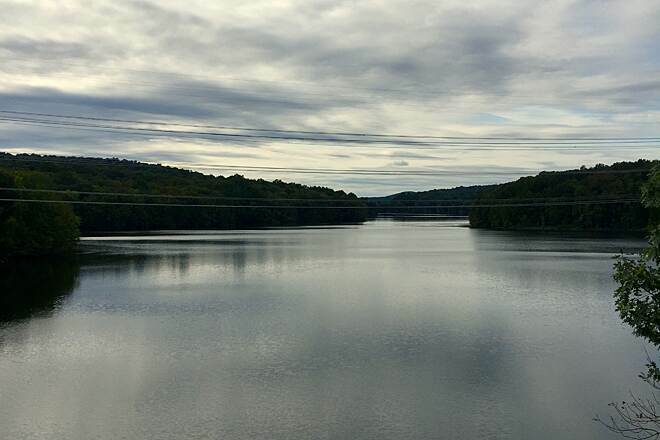 Many scenic views will be in store for trail users, particularly near the New Croton Reservoir in Kitchawan. However, be ready for some not so scenic views of sewerage treatment plants and industrial buildings as well. There was plenty of free parking at my starting point in Millwood. However, I noticed no parking at the trailhead in Baldwin Place. 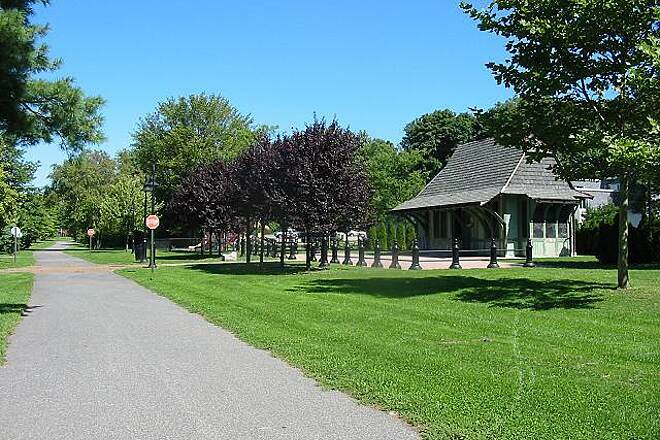 The Railroad Park in Yorktown Heights looked like an excellent place to stop for a picnic. There were plenty of tables and benches. 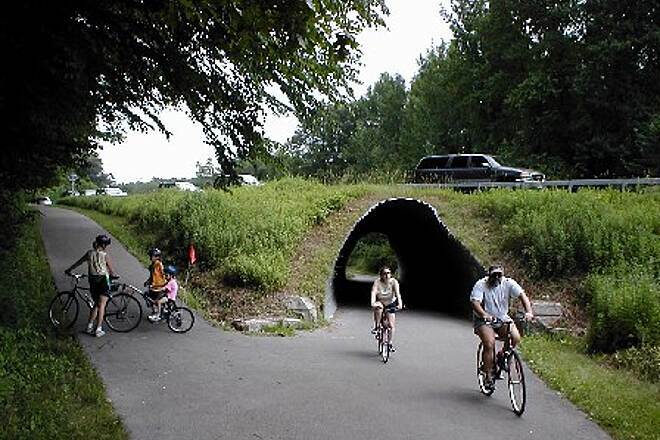 This is a great trail that everyone should bike at least once. "very good, but any plans to continue into Putnam County? Very wild area free from roads etc, it would be GREAT! Thanks." 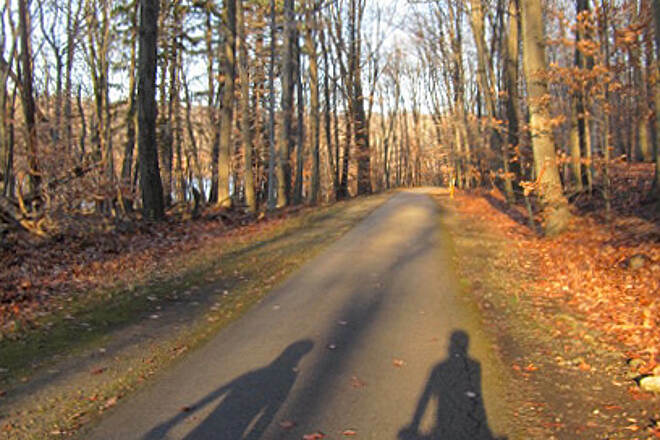 "On Sunday, 03/25/01 I biked the non-paved section from Eastview to Warehouse Lane in Elmsford. A nice trip for experienced off-road bikers. Watch for glass near the Coca-Cola bottling plant though. 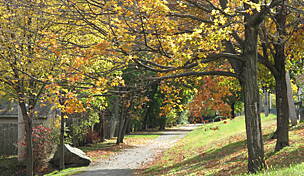 Westchester County Parks says that this section should be paved by the Summer of this year. Evidence of survey markings and pre-construction activity was noted." 10/10/2000It was great to discover that the damage this trail experienced in the fall of 99 has been repaired.I first dicoverd this trail in 1998 and have ridden it in length over 20 times. Caution should be used by bikers as this trail has many other recreational uses though most people using it are recreational bikers. As a deversion when riding up to Baldwin I have found that taking the main road east to Rt.212 and south to Rt. 35 and turning right back to the trail is a nice ride with little traffic.